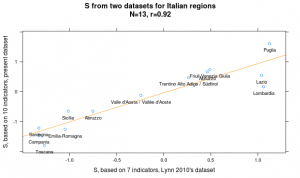 I analyze the S factor in Italian states by reanalyzing data published by Lynn (2010) as well as new data compiled from the Italian statistics agency (7 and 10 socioeconomic variables, respectively). 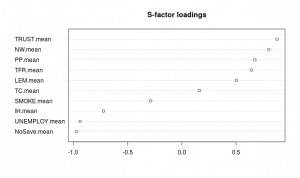 The S factors from the datasets are highly correlated (.92) and both are strongly correlated with a G factor from PISA scores (.93 and .88). One can study a given human trait at many levels. Probably the most common is the individual level. The next-most common the inter-national, and the least common perhaps the intra-national. This last one can be done at various level too, e.g. state, region, commune, and city. These divisions usually vary by country. The study of general intelligence (GI) at these higher levels has been called the ecology of intelligence by Richard Lynn (1979, 1980) and the sociology of intelligence by Gottfredson (1998). Lynn’s two old papers cited before actually contain quite a bit of data which can be re-analyzed too. I will do so in a future post. I also decided that this series of posts will have to turn into one big paper with a review and meta-analysis. There are strong patterns in the data not previously explored or synthesized by researchers. Lynn has published a number of papers on the regions of Italy (2010a, 2010b, 2012 and Lynn and Piffer 2014) and it is this topic I turn to in this post. These data are given for 12 Italian regions. Lynn himself merely did correlational analysis and discussed the results. The data however can be usefully factor analyzed to extract a G (from the three PISA subtests) and S factor (from all the socioeconomic variables). I imported the data into R.
This plot reveals no surprises. Being dissatisfied with the data Lynn reported, I decided to collect more data. 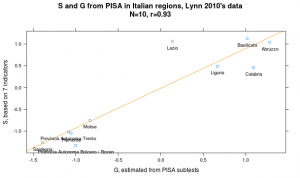 The PISA 2012 results have PISA scores for more regions than before which allows for an analysis with more cases. 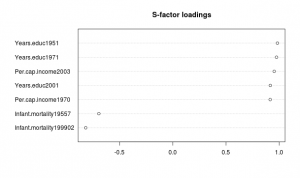 This also means that one can use more variables in the factor analysis. The new PISA data has 22 regions, so one can use about 11 variables. However, due to some missing data, only 21 regions were available for analysis (Südtirol had some missing data). So I settled on using 10 variables. For all variables, I calculated the mean for all years. I fetched the last 10 years for all data when available. For cognitive data, I fetched the regional scores for reading, mathematics and science subtests from PISA 2012, Annex B2. There are two odd results. Total crime rate has a slight positive loading (.16) while intentional homicide rate has a strong negative loading (-.72). Lynn reported a similar finding in his 1980 paper on Britain. He explained it as being due to urbanization, which increases population density which increases crime rates (more opportunities, more interpersonal conflicts). An alternative hypothesis is that the total crime rate is being increased by immigrants who live mostly in the north. Perhaps one can get crime rates for natives only to test this. A third hypothesis is that it has to do with differences in the legal system, for instance, prosecutor practice in determining which actions to pull into the legal system. 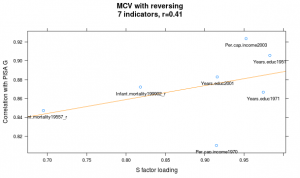 The second odd result is that fertility has a positive loading. Generally, it has been found that fertility has a slight negative correlation with GI and s factor at the individual level, see e.g. Lynn (2011). It has also been found that internationally, GI has a strong negative relationship, -.5 to -.7 depending on measure, to fertility (Shatz, 2008; Lynn and Harvey, 2008). I also found something similar, -.5, when I examined Danish immigrant groups by country of origin (Kirkegaard, 2014). However, if one examines European countries only, one sees that fertility is relatively ‘high’ (a bit below 2) in the northern countries (Nordic countries, UK), and low in the southern and eastern countries. This means that the correlation of fertility between countries in Europe and IQ (e.g. PISA) is positive. Maybe this has some relevance to the current finding. Maybe immigrants are pulling the fertility up in the northern regions. There is little to report from the factor analysis of PISA results. All loadings between .98 and .99. For one case, the Lynn dataset had data for a merged region. I merged the two regions in the new dataset to match it up against the one from Lynn’s. This is the conservative choice. One could have used Lynn’s data for both regions instead which would have increased the sample size by 1. 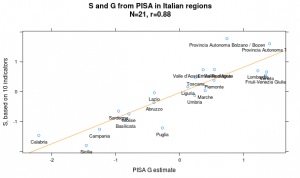 The results for the regional G and S in Italian regions are especially strong. They rival even the international S factor in their correlation with the G estimates. Italy really is a very divided country. Stability across datasets was very strong too, so Lynn’s odd choice of data was not inflating the results. 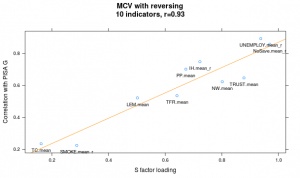 MCV worked better in the dataset with more and more diverse indicator variables for S, as would be expected if the correlation was artificially low in the first dataset due to restriction of range in the S loadings. All project files (R source code, data files, plots) are available on the Open Science Framework repository. Thanks to Davide Piffer for catching an error + help in matching the regions up from the two datasets. Kirkegaard, E. O. (2014). Criminality and fertility among danish immigrant populations. Open Differential Psychology. Lynn, R. (1979). The social ecology of intelligence in the British Isles. British Journal of Social and Clinical Psychology, 18(1), 1-12. Lynn, R. (1980). The social ecology of intelligence in France. British Journal of Social and Clinical Psychology, 19(4), 325-331. Lynn, R., & Harvey, J. (2008). The decline of the world’s IQ. Intelligence, 36(2), 112-120. Lynn, R. (2010a). In Italy, north–south differences in IQ predict differences in income, education, infant mortality, stature, and literacy. Intelligence, 38(1), 93-100. Lynn, R. (2010b). IQ differences between the north and south of Italy: A reply to Beraldo and Cornoldi, Belacchi, Giofre, Martini, and Tressoldi. Intelligence, 38(5), 451-455. Lynn, R. (2011). Dysgenics: Genetic deterioration in modern populations. Second edition. Westport CT.
Lynn, R. (2012). 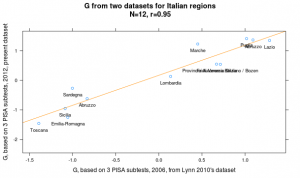 IQs in Italy are higher in the north: A reply to Felice and Giugliano. Intelligence, 40(3), 255-259. Piffer, D., & Lynn, R. (2014). New evidence for differences in fluid intelligence between north and south Italy and against school resources as an explanation for the north–south IQ differential. Intelligence, 46, 246-249. Shatz, S. M. (2008). IQ and fertility: A cross-national study. Intelligence, 36(2), 109-111.